Merry Christmas my friends and family. This year I decided to simplify some of my decorating so that I could have a little more time to paint, bake and enjoy the season. I have so many treasures that I enjoy putting out every year, but I do try to change things around a little. 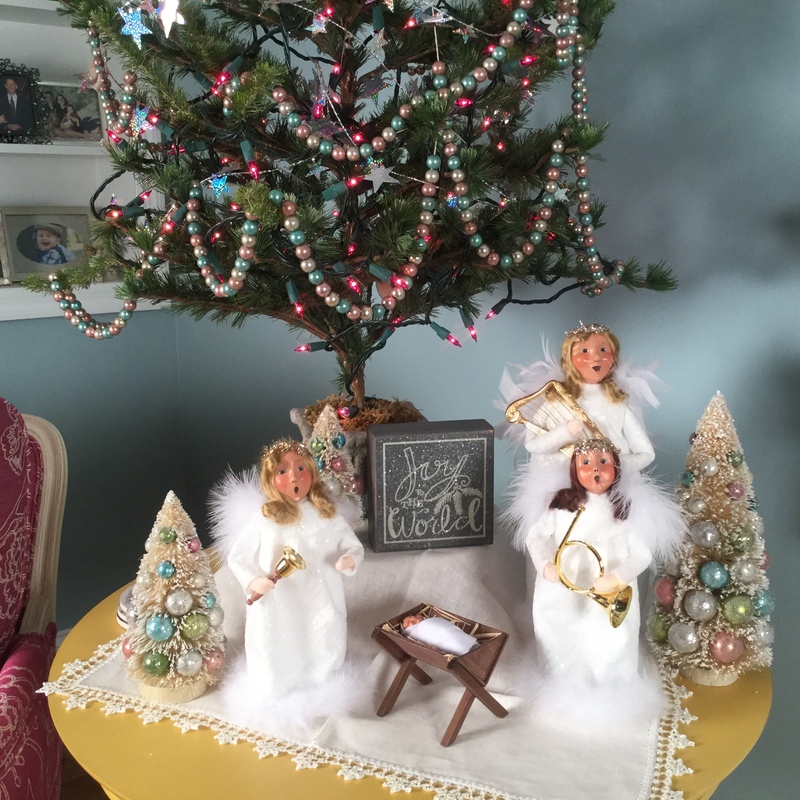 As you come in the front door you will see some of my Byers Choice angles and an angel tree which is a Rosemary West design that I painted years ago. The tree is still one of my favorites. To the right of the fireplace are more Byers Choice angels and a smaller tree. My dining room and living room is one large room so I put up two larger trees and the small pink tree you see above. These angels were in the “Create a Mixed Media Christmas with Friends” book. They sit on my dining table. I also put an angel tree in the room. At the front window I have a flocked tree with ornaments on it that remind me of people I love, places that we have been, and things that we enjoy doing. I have two dolls (The Ladies) that sit beside the tree. I made the dolls for my aunts over 30 years ago. They are a sweet reminder of them and the fun we had together. Here are a few more close-ups of the tree. This year in my family room I added lots of silk greens and berries, shiny reflective balls and some favorite ornaments. I love how it turned out. The tree sits next to the fireplace in the family room. Because of my book Jane & Amy Create Christmas that I did with my friend Amy Mogish I decided to use some of those projects in my decorating this year. The mantle is long with my snowies on one end and my Advent tree from the book on the other end. On top of the entertainment center are white glitter houses and trees. In the entertainment center is another project from the book. My angel from the book sits on a hutch with another angel hanging from the top doors. “Sweet Treats Santa” is on the kitchen counter with my “Sweet Friends” painting. On my kitchen island is one of my Glitter house creations that I will be doing a post about in the future. Behind the house you can see some fresh baked rolls that I will also do a post on soon. May you have a very blessed Christmas my friends. Jane your house is just beautiful. My favorite was meeting you aunts. You could feel the Christmas season from the outside to the inside. Thank you it has left me with a good feeling and a smile. Lynda Zaraza ps Merry Christmas! Jane I love seeing the Christmas Tour of your home. Especially all the beautiful painted pieces you have on display! Happy New Year to you and your husband! Hope I see you somewhere in 2017. Thank you Robin, happy New Year to you and yours. Hope to also see you this year!